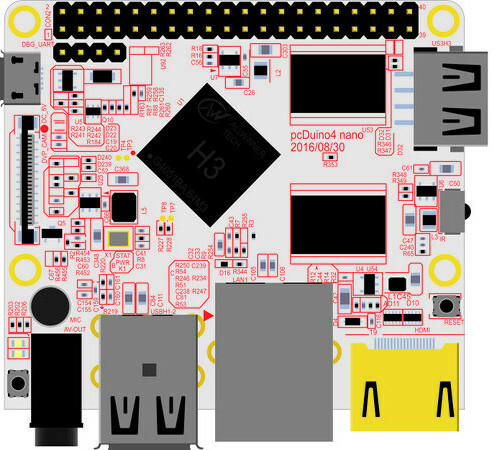 We already have plenty of low cost Allwinner H3 development boards thanks to several Shenzhen Xunlong Orange Pi boards and FriendlyARM NanoPi boards among a few others. Here comes another one with pcDuino4 Nano. Misc – Power and reset buttons; 2x LEDs; IR receiver; on-board microphone. Power Supply – 5V/2A via micro USB port; 5V via VDD_5V pin on 4-pin serial header. pcDuino4 Nano can be pre-ordered for $20 + shipping ($20 extra in my case) with delivery scheduled to start on September 24th. For reference, NanoPi M1 board with 1GB RAM is now sold for $16 + shipping ($5). Whats the point when H5 is right around the corner ? That’s definitely not for $20. Funny. Orange Pi PC has exactly the same feature set, the better voltage regulator allowing to clock faster (1.3 GHz) and is way cheaper if shipping costs are also considered. ‘Power Supply’ and ‘Dimensions’ are wrong in description above and on seller site. I’ve found the right dimensions (I think), but I can’t find 100% clear info about power supply. Do you mean the 5V pin on the headers can’t be used to power the board? Not only that, I read that Orange Pis have some ‘heatsink’ inside the circuit board, which makes the CPU a bit cooler. The NanoPis run hotter. Maybe they come up with similar fixes for the M1 too… but it’s true that even the small Oranges remain cooler than NanoPi M1 due to ground plane acting as one large heatsink.